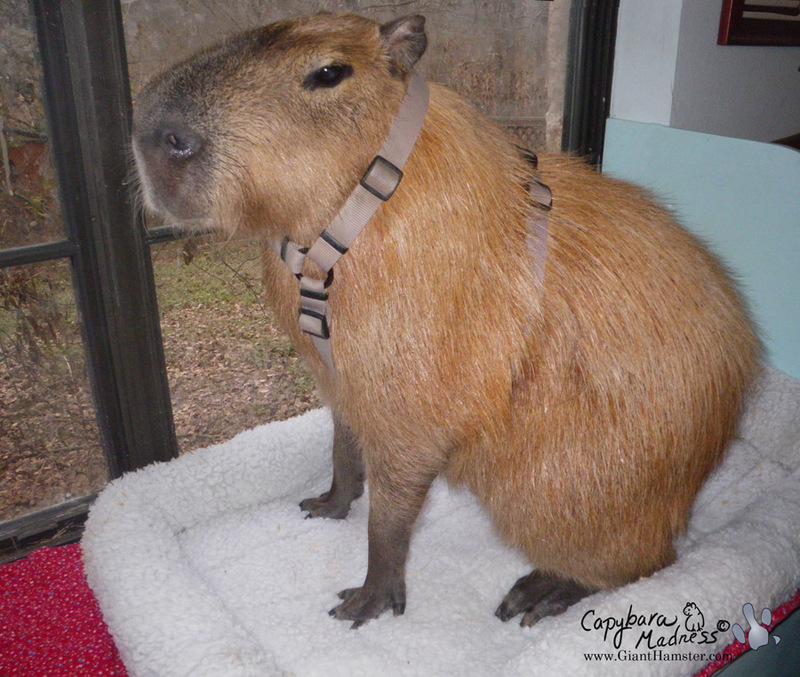 Twice the capybara, twice the harness! But look, in the photo above I have both harnesses on and still no blood! But you should be suspicious, Melly sometimes edits unpleasant things out of photos. She is sneaky like that. So you’ll have to take my word that I have become ever so much better about wearing my harness! And about riding in the car too. I don’t shake with nervousness when I am in the car anymore. I don’t sweat in the car anymore either, especially if my Rick is with me. I’m much calmer with my Rick around. Take today when Rick, Melly and I all went to the bank. Did you know pets can go into banks? I guess you don’t see many of us in banks because we don’t have much money. 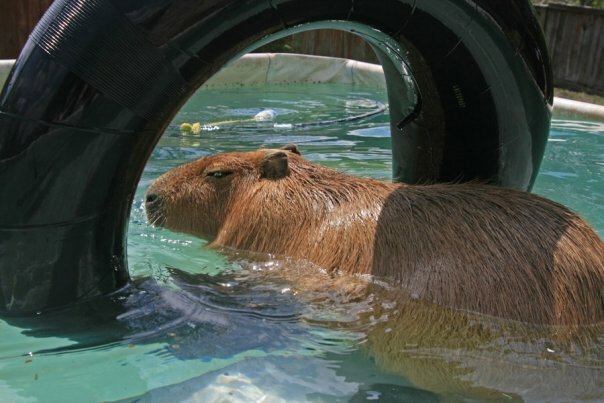 Melly and I have our Capybara Madness store though so I have more money than most pets. Still, I had never gone to the bank before today. Anyway, the point is, I was very calm, cool and collected almost the whole time. 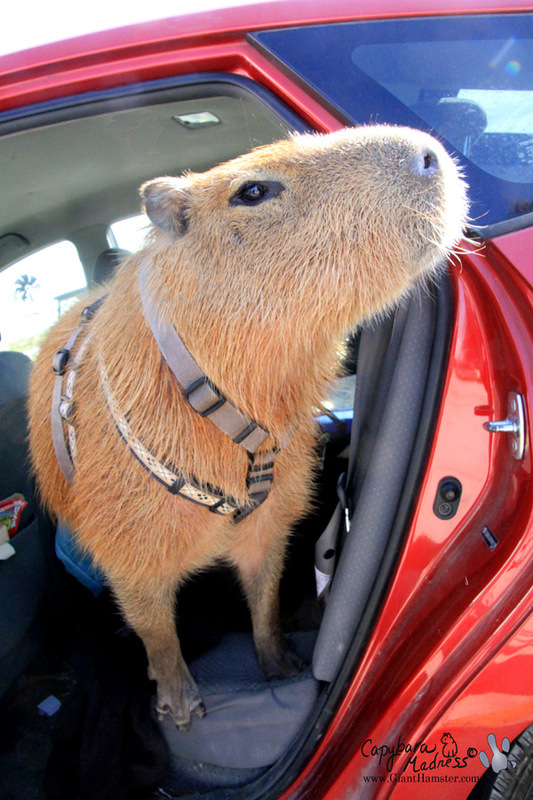 Unlike pet stores that I’ve been to, the bank had capybara treats. They are called cookies and they are delicious. I had never met Lindsay before but she seems nice enough. She is the only person in the whole world whose first reaction when seeing me was, “I thought he was bigger than that!” No one ever says that! 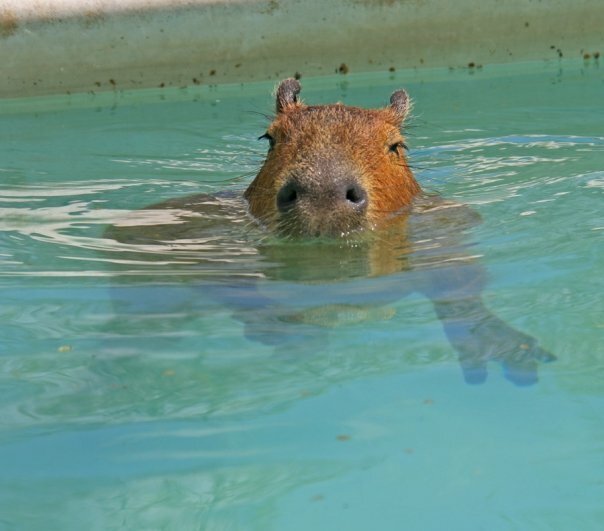 Robert also works at the bank. His reaction to me was much more normal, “I didn’t think he would be that big!” This is the correct reaction. 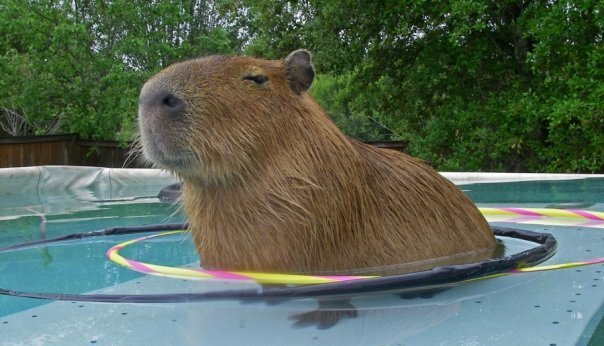 Don’t I look calm in those photos? Actually, I wasn’t. My Rick was taking the pictures which meant I wasn’t right next to him like I want to be when we are not at home. I had to drag Melly across the cement to get back to him. Once I had my nose on my Rick’s knee again, I felt much better. The thing I liked best about the bank trip, other than the cookies, was that it was quick. That has been the theme of my trips lately, go someplace close for just a little while. One of the least stressful places I go is to the new Tractor Supply store in Buda. Why does the car stop anywhere but home? Tractor Supply is less scary than some places because there aren’t usually many cars or people and it’s not too close to the big road. 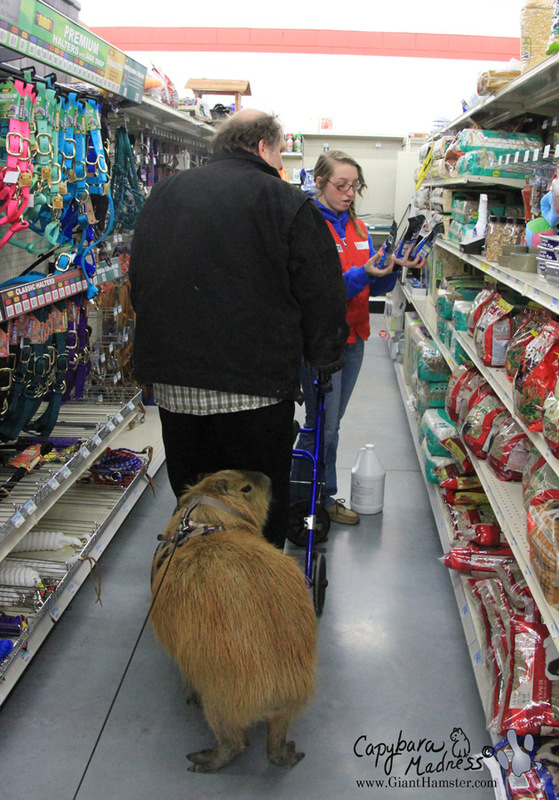 Another good thing about Tractor Supply is that my Rick always goes with me. You can see how I normally walk nose-to-knee with my Rick when we are away from home. In the photo above, one of the clerks is helping us find the Yogis. 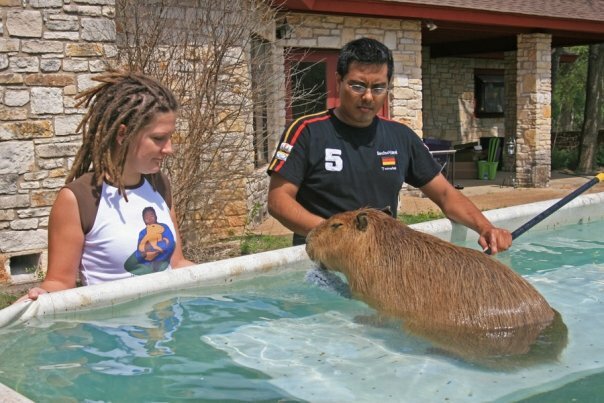 Yogis are yogurt drops for guinea pigs and I love them! 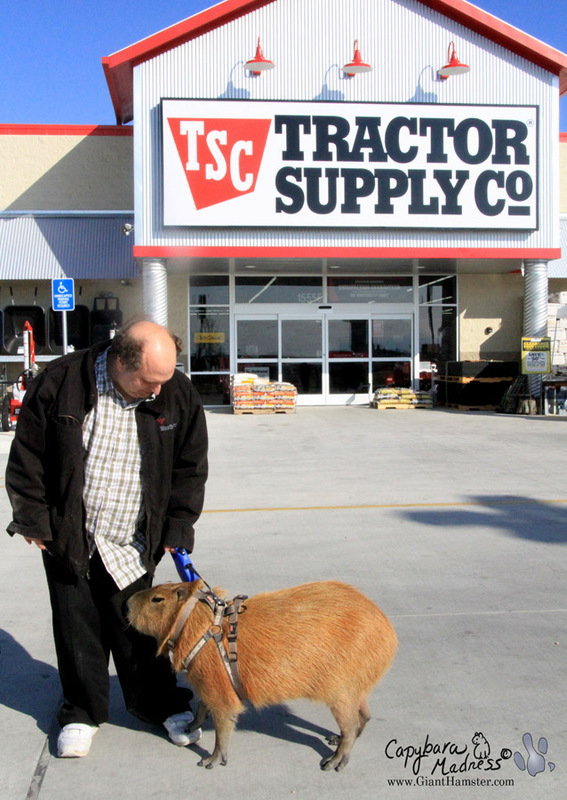 I also like that Tractor Supply has a big outdoor area that is pretty interesting to roam around in. When I am out there, I don’t always have to have my nose on Rick’s knee. Rick isn’t a fast walker and there’s an awful lot for me to explore so I normally just go off on my own, dragging Melly behind me, Rick gets to sit on his walker and wait for us to return. But one day that isn’t what happened! One day, I was off exploring with Melly when I looked back and saw that my Rick was gone! Disappeared! Evaporated! 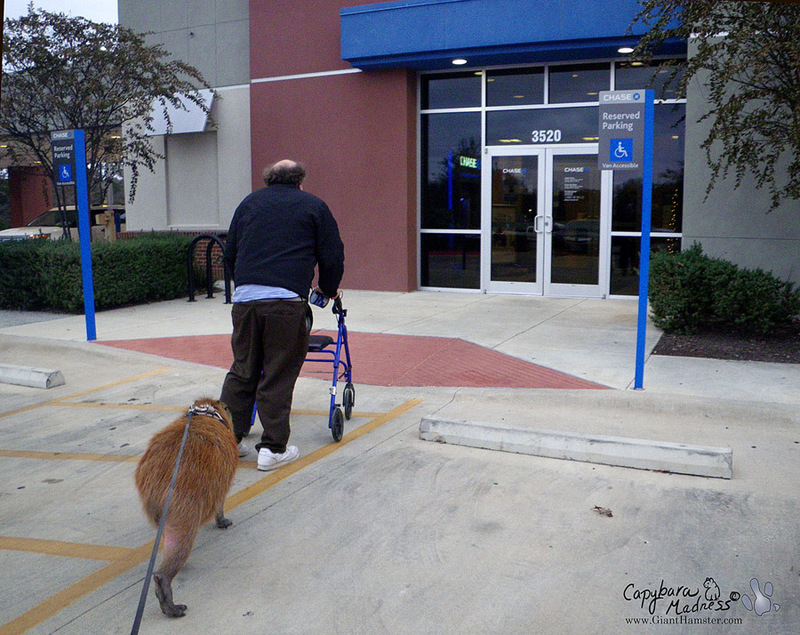 Only his walker was left behind! I seriously thought space aliens had come and abducted him! Time to panic! Luckily, my Rick eventually reappeared and all was right with the world once more. Maybe I should have trusted Melly when she said my Rick would come back but it wouldn’t have been the first time she’s lied to me. Here’s the really scary part, I heard my Rick tell Melly that the three of us should go spend a night in a hotel! Apparently they think it might be good in case of emergency or whatnot if I got used to staying someplace else overnight. The thought of it is putting my little heart all a-flutter. But I guess it will be okay as long as I have my Rick with me. Okay, those panicked squeaks are just about the cutest sounds I’ve ever heard. I wish we had a tractor supply store here! 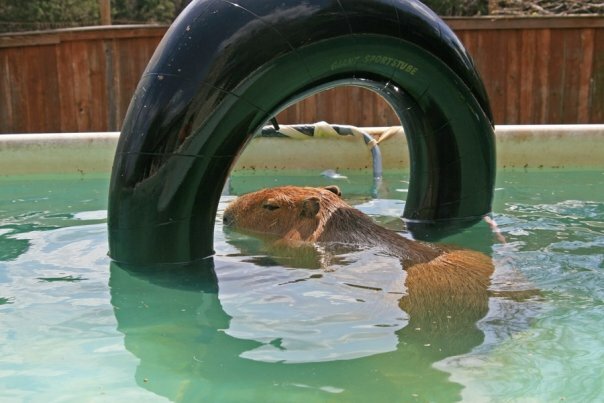 I will try to go to the feed store. I have been to the bank before. They all know me there! But Gari, I have never made that crybaby noise that you are making when Rick disappears. That’s a new one! I don’t think you have brayed, though. You can really see how much Rick means to you!!!! Darling! Such a bond he has w/Rick, it’s amazing! OH Gari you must really love your Rick. I cry too when I get scared. there are a lot of walkers like Rick’s in my building. I don’t go a lot of places outside our building but I do go downstairs in my carry basket. Then my neighbors get to visit with me and pet me. Sweet little old ladies can be very nice. They like to feed me carrots. 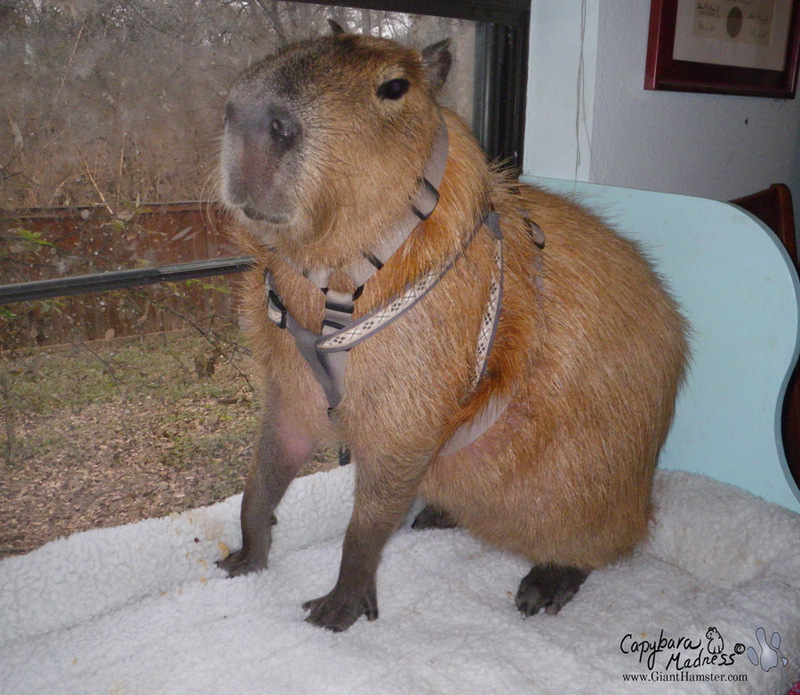 Seems like a Rick is VERY good thing to have – especially when he’s your Capy slave. 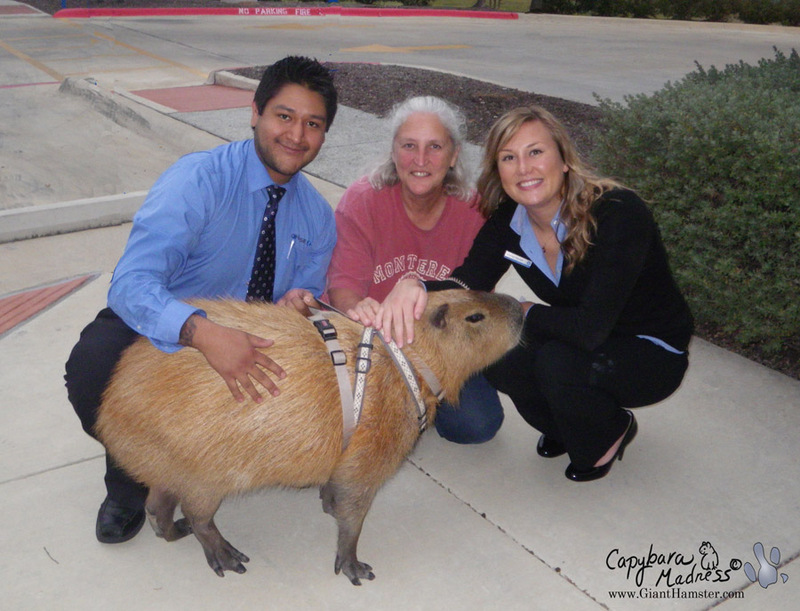 I think you have to excuse Lindsay at the bank…she probably needs some more education on how big Capys are – she seemed nice! Staying at a hotel is fun — you should try it at least once! 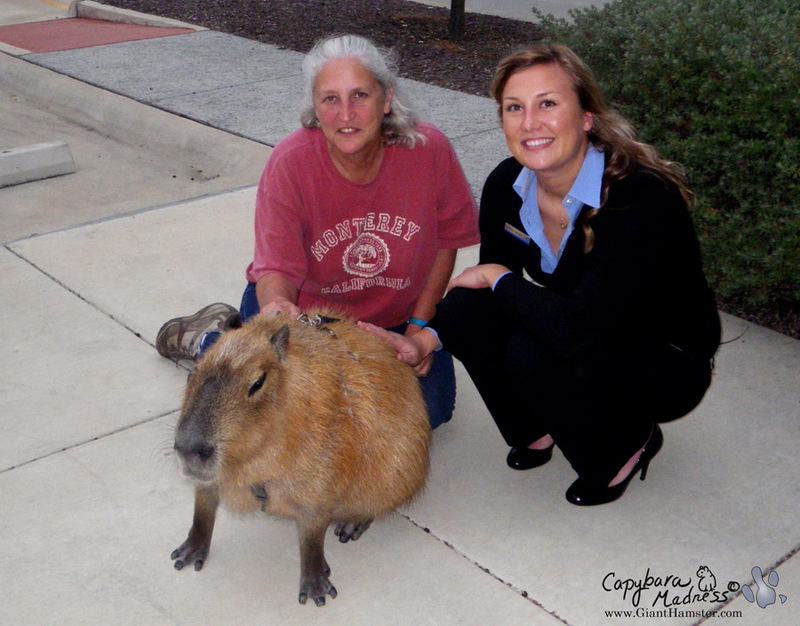 Make sure it’s a hotel that allows Capys! I heard you calling for Rick and then your happy sounds when he came back! 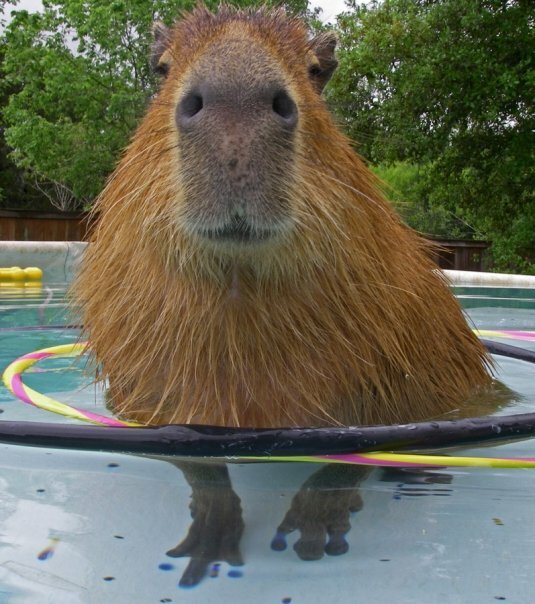 Like to hear your Capy voice! Thanks for posting your adventure! 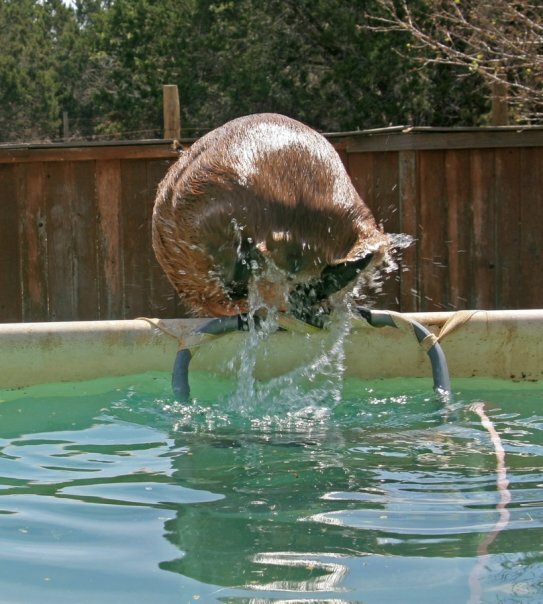 Oh my goodness, Gari’s noises are very much like those my guinea pig, Dora makes. She even makes the happy twittering noise. 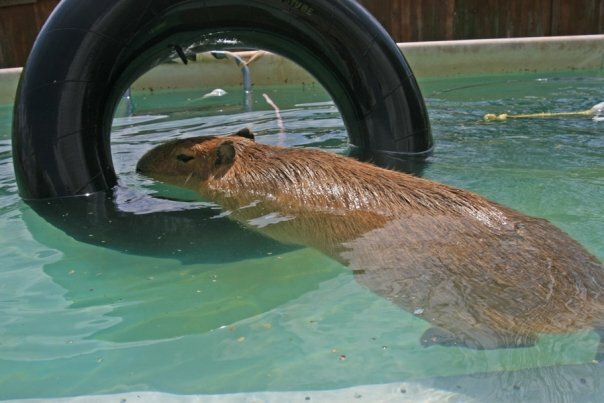 Capys & cavies must be very closely related. 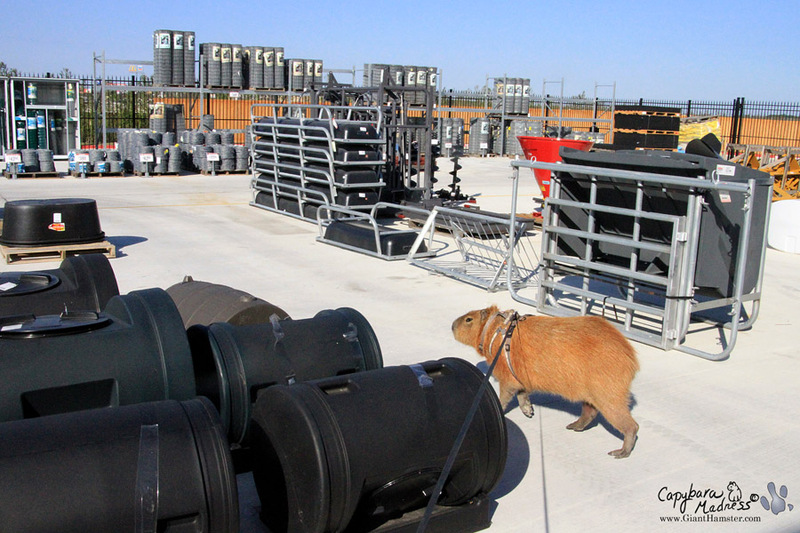 I hope Gari got to finish exploring the outdoor area after Rick came back. I noted that Melly is listed as “Gari tormentor” in the cast list. Is that really fair? It’s not like Melly went & hid Rick just to upset Gari. I’m sensing that Gari was the one writing up the the credits at the end. But see, it all worked out OK ! I’ve got a new Saying for Gari to learn. “When I’m with my Rick, things go pretty slick.” Not too bad, huh, Gari? Tell me what YOU think. Please. Oh Gari, you are so darn cute!! 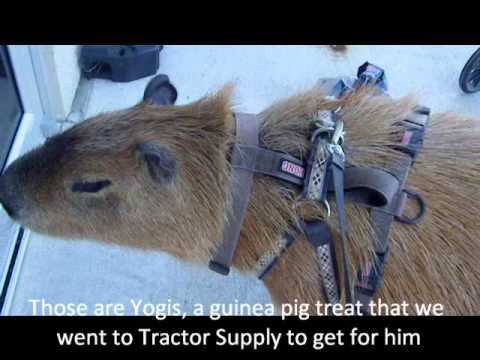 Looks like you had some fun at Tractor Supply and got your Yogi’s. Our rabbit Graycee loved them. You are really being a good boy. Keep being a good boy too.